The award-winning Adventure Seekers Saga is a series of four visionary fiction novels beautifully illustrated with original Odin’s Runes and Hope’s Heart Tarot Cards. The fast-paced adventure, liberally sprinkled with witty banter and comical situations, takes place in an Old West setting you’d like to visit with characters you’d love to meet. 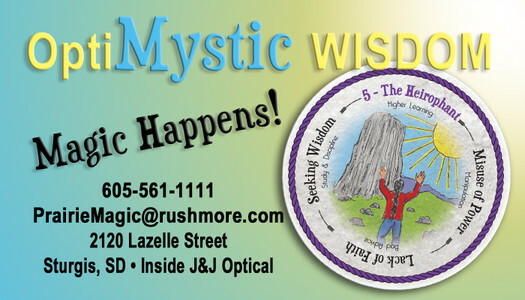 Throughout the series, ancient wisdom helps our heroes conquer modern-day problems as they muse about Tarot cards and moon over Rune stones. Prairie Magic: In this uplifting, captivating story, experience the thrills and chills of the Hansons and Good Elks as they overcome adversity while fighting for a better future—for their families and their beloved town of Buffalo Grass. Prairie Magic is teeming with powerful messages about living a positive, healthy life—physically, emotionally and spiritually. It’s an inspirational story about faith, forgiveness and love. Meet Floridian Victor Garcia as he stumbles into South Dakota during an annual rodeo event and falls in love with our beautiful heroine, Hope Hanson. Let the waterfalls and Mansi Good Elk’s tender loving care lull you into a peaceful, healthy state at her Plucked Flower Spa. Join the excitement as an array of fascinating characters are mysteriously guided into each other’s paths, and learn to summon the courage, optimism and creative vision needed to establish fulfilling, authentic lives. Along the way, they are guided by the ancient wisdom of Tarot cards and Rune stones in this exciting tale of struggle and triumph! Rebel: Saddle up for a rollicking ride as Rebel, the spirited steed, teaches us to boldly follow our own paths! Get to know Wolfgang Eichenberg as he endeavors to transform a rundown Wyoming ranch into a profitable family resort—with the help of a colorful crew of creative, enterprising friends. Visit the stunning Devils Tower monument and learn the Native American lore of this sacred monolith. Mystery and tension abound in this tale of self-discovery and spiritual transformation: Why is Patwin Good Elk acting so strangely? Will Mansi’s and Grace’s alternative healing methods save Blake’s life? And how will best friends Tokada Good Elk and Victor Garcia lead their families through life’s trials and tribulations to help them emerge victorious through faith, courage, and belief in themselves and their dreams? Study Astrology signs and Rune stone messages—and muster the courage to become a rebel yourself! A Fork in the Road: As the unlikely duo, Patwin and Rod, race off on a secret, daring rescue mission to Mexico, the Adventure Seekers crew celebrates their amazing achievement—transforming a rundown Wyoming ranch into a profitable resort in a matter of weeks. Meanwhile, dangerous criminals are in hot pursuit of Brie, one of the crew members who had witnessed a murder. Join our friends as they make an astonishing discovery: a treasure trove of gold that had been hidden for over a century! Gallop along with Tokada Good Elk through his Trip Through the Heavens and experience the exhilarating power of spiritual transformation. Amid all the excitement, romance blossoms, friendships are forged and our heroes encounter miracles, while learning about the mysterious divination meanings of Rune stones and Tarot cards! Scorpio: Kick up your heels and celebrate in style as Victor and Hope finally tie the knot! But be warned: all is not hunky dory—your favorite characters face trials, turmoil and tribulations. Cheer them on as they learn to release what no longer serves them to overcome perilous situations and heartbreaking circumstances—and move forward to fulfill their destinies. Root for Julio as he slays his inner dragons in order to bravely face the notorious mobsters plotting against him—and watch with delight as our heroes execute a brilliant scheme to help him vanquish evil! How will Faith resolve the love triangle she’s tangled up in and reclaim her rightful role as a respected leader? Sit with her and her grandmother to consult Rune stones and Tarot cards for wisdom and guidance. Ride along with Victor, Oliver and Patwin as they retrace Patwin and Rod’s traumatic trek through Mexico to seek redemption and healing. Brace yourself for a riveting showdown between Kyla and Cicatriz de Diablo, the dangerous drug lord who wants her dead. Our story finds resolution in the astrology sign of Scorpio, when revered heroes and beloved heroines find completion, love and self-empowerment, and the wretched villains meet their destinies and face consequences. Scorpio represents the complete circle of life. And with this final story, you’ll find that every ending is a new beginning.